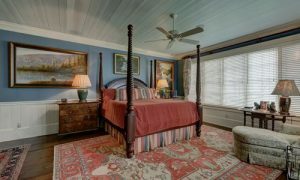 Don’t forget the bedroom when it comes to smarter Highlands NC homes. The bedroom is a perfect spot for smart home improvements. After all, where better to have everything operate at the push of a button or the sound of your voice. Whether you want the lights to turn off or the temperature to adjust, smart improvements make life easy. If you are preparing a Highlands NC home for sale consider making some smart home improvements. And, don’t forget the bedroom! Window treatments that open and close at voice command or the touch of a button are great. This is even better when it can be done from bed. Automatic shades with smart access are a fantastic smart home upgrade. Furthermore, opening and shutting the shades from bed helps create a true retreat feel in any master bedroom. What else makes like easy in a bedroom? Operating the lights from voice control. Smart light bulbs are an easy install. Simply tell Alexa, Siri or Google to run on the lights or turn` them off. There is no need to fumble around in the dark tripping over your slippers! Making smart improvements to Highlands NC homes does not have to be difficult. Contact me, Lynn Kimball, today to learn more about Highlands NC real estate. I welcome the opportunity to update you on market conditions while helping you get to know current home trends. Let my knowledge and experience serve as your guide to Highlands NC homes. Click here to read “The Ultimate Smart Home: Bedrooms” from REALTOR Magazine.